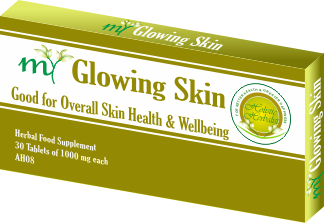 Holistic Herbalist presents 'My Glowing Skin' - herbal supplement for natural skin health. It helps to assist in guarding your skin wellbeing in many unparalleled manner. It could be possible that many of you might not be aware of such type of natural and herbal skincare. Skin is both one of the most cared and one of the most ignored organ of the body. For many people herbal supplements for skin might be a far off possibility even though they might actually require one. Even though beauty is not limited to outer appearance, but it really counts. Can you ever ignore the confident and radiant look and persona it exudes? First, let me introduce with skin as it plays many more roles that you generally consider. I am your Glowing Skin. I rank first among organs spanning over the largest surface area. I am the largest organs in body. Except my outermost layer, I am deeply living and breathing organ having rich supply of blood and nerves. I can be somewhere 1.5 to 2 square meter in surface area, having average thickness of 2-3 mm. Each square inch of me contains 650 sweat glands, 20 blood vessels and 60,000 pigment cells and 1000 nerve endings. I am the first and foremost defense of the body from external environment and make you waterproof. Without me, life will end in just few hours. Additionally, I have Langerhans cells that helps to defend by working as a part of your immnue system. Because of me, you are able to feel temperature, touch, pressure, vibration and injury. I add all these dimensions to your life and enrich your life. Can you ever forget the soft and smooth touch of baby and children, warm hug of people you love, and intimate relationship with your partner? Everything, including sexual intimacy, goes around and through me. As a human being, you have a present temperature. I help to regulate heat and temperature in body. I regulate the water and electrolyte balance as well. I tend to work as a store of water and lipid. I provide the cushion like protection for internal organs even in skinny individuals. Even though, I can't support your weight, but I help to synthesize Vitamin D naturally with sunlight and help to keep your bones strong. Above all, I give great looks and feels to you, makes your first impression. The entire anti-aging industry is supported on the hope to bring me back to youthful days or retard aging effects. PS: 'My Glowing Skin' tries to make my first impression 'the best impression'. Don't worry, you can always improve it with these herbs and make it better. Sorry! I forgot to mention my role in body language and communication. I act as the true, that few can people can disguise, mirror of your true feelings and emotions. Ayurveda Wisdom presented to you in the form of 'My Glowing Skin'? Neither Ayurveda, nor Holistic Herbalist is against use of cosmetics or natural cosmetics. But we want to translate the wisdom of Ayurveda and herbs for skin wellbeing into a herbal supplement and it is really one of the best way to present it through 'My Glowing Skin'. Ayurveda mentions skin as as a seat of Bhrajaka Pitta, Vyana Vata and Kledaka Kapha - a dynamic equilibrium of heat, sensations and moisture. Bhrajaka Pitta refers to metabolic and heat and temperature regulating activities of skin. Vyana Vata is responsible for various nervous sensations that we perceive through skin. Kledaka Kapha helps to balance moisture, softness and suppleness of skin. Ayurveda described skin as composed of several layers, mentioning their function and matching the 'complexity' of description as found in medical Anatomy. Even, complexion, color, texture and other parameters are explained as they are related with aesthetic and cosmetic sense of skin as well as their relation to skin disorders. Skin health has close affinity with liver and blood health. Actually some liver and blood detox and cleansing herbs are commonly used for wellbeing of skin. Use of natural herbs in the form of 'My Glowing Skin' can really provide the true and rather missing element and you can use it as natural 'Internal Cosmetic' that takes care of this wonderful organ from inside out. Why do you need herbs or herbal supplement for skin health? Holistic Herbalist come forward with a natural support for skin health and wellbeing along the lines of Ayurveda herbs and wisdom. It is all Natural, Safe and Effective combination of Ayurveda herbs that you can use as a herbal supplement. I love My Glowing Skin. It helped to clear my skin and face naturally without using any harmful cream or cosmetics. WHAT IS THE PACKAGING OF MY GLOWING SKIN? My Glowing Skin comes in two packagings. Bottle or Box. One box or bottle contains 60 Tablets of 1000 mg each. HOW SHOULD I TAKE MY GLOWING SKIN? Generally, any adult person over the age of 16 can take 2-4 tablets daily, always after meals, with water. You can take 2 tablets after lunch, and 2 tablets after dinner; or 1 tablet after breakfast, 2 tablets after lunch, 1 tablet after dinner. It can be taken with water or juice or milk, after breakfast, after lunch, or after dinner. If you are taking 2-3 tablets daily, take 1 tablet after breakfast, 1 tablet after lunch and 1 tablet after dinner. Once, you have sufficient relief for a period of 2-3 months, this can be brought down to 2-3 tablets per day. Of course, you would be welcome to send us a query in this regard and we will be happy to help you. My Glowing Skin is a perfectly safe combination of Ayurveda herbs. This is a very specific herbal supplement. You can easily take it continuously for 3 months, 6 months or more. CAN I TAKE MY GLOWING SKIN DURING PREGNANCY & BREAST FEEDING PERIOD. No! You can't take it during pregnancy and breast feeding period. DO YOU SUGGEST ANY OTHER HERBAL SUPPLEMENT WITH MY GLOWING SKIN? We highly recommend My Joyful Mind and My Active Liver along with My Glowing Skin, especially in all chronic conditions of skin like allergy, eczema etc. You can take only 2 tablets of My Joyful Mind daily, and 2 tablets of My Active Liver along with My Glowing Skin. The herbs in My Joyful Mind are very much required in all autoimmune disorders, chronic and progressive disorders, as all these conditions put a lot of stress on our nervous system and body. Taking something as good as My Joyful Mind helps to take care of 'mind' side of body-mind equation of chronic health issues. In the same manner, in various types of long standing skin allergies, psoriasis, and other chronic skin problems, it is advisable to use My Active Liver also with My Glowing Skin and My Joyful Mind. My Active Liver works on a deeper level of tissue and blood detox, of course with liver detox. Get the Goodness of All These Herbs, within Every Single Tablet of Glowing Skin...Use it Now! I have used this wonderful supplement for myself and have suggested to many clients and friends. These herbs have never disappointed me. 1 Month Supply = 1 Box / Bottle of My Active Liver + 2 Box / Bottle of My Glowing Skin. 1 Box/Bottle contains 60 Tablets. 1 Month Supply, US$105, US$86 Only, Save $19. 1 Month Supply = 1 Box / Bottle of My Joyful Mind + 1 Box / Bottle of My Active Liver + 2 Box / Bottle of My Glowing Skin. 1 Month Supply, US$138, US$100 Only, Save $38.